The concept of pneumatic or inflatable tires dates back to 1888 when 'John Dunlop' invented the first air-filled tire for bicycles. Since then pneumatic tires have been put to use in a wide variety of automobiles and vehicles with varying sizes and capacities. However with the benefits comes the problem of maintenance and age. Add to that the accidents that happen around the world due to tire bursting in moving vehicles. This past week at the 2nd Tokyo Motor Show 2011 in Japan, Japanese tire manufacture Bridgestone Corporation unveiled its new puncture-less air-free tires concept. Although the concept is not something very new, back in 2005 Michelin had showcased a similar kind of technology named TWEEL (i.e. Tyre/WhEEL). Since then there hasn't been any significant development until this one from Bridgestone. The main difference that sets Bridgestone's airless tire different from Michelin's TWEEL is the kind of materials used for the development and the design. 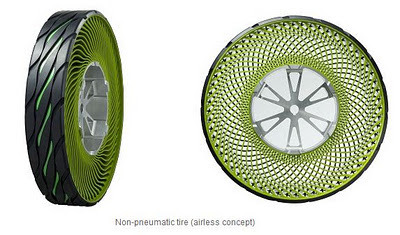 The Bridgestone airless tire is made from reusable thermoplastic resin. The tire has a very minimum use of rubber which makes it more environment friendly. Bridgestone claims that the tire is made out of 100% recyclable material. The tire has a unique structure of spokes stretching along the inner sides of the tires supporting the weight of the vehicle and obviously there is no need for periodical refilling, what that means is the tires require less maintenance. At the same the worry of puncture is eliminated. The main aim for Bridgestone is pursuing this technological development with the aim of achieving what it calls a "cradle to cradle" process that aims to proactively maximizes the cyclical use of resources from worn tires into new tires by the use of recyclable resources. What that means is, these tires can be developed by using existing recycled materials. The tire is still under development and testing. Bridgstone plans to put it in mass production and start sales in 2013.